Switzerland based packaging firm Tetra Pak has launched two new portion size packages to meet the demands of the on-the-go beverage market. The new packages, the Tetra Prisma Aseptic 200 and 250 Edge with DreamCap 26, are designed to offer smaller size options for consumers. Designed based on the Tetra Prisma Aseptic 330ml with DreamCap, the new packages feature same re-sealable one-step closure for an optimized drinking experience. The firm said that the Tetra Prisma Aseptic 330ml with DreamCap has become the portion pack of choice for more than 340 brands. Tetra Pak product management and commercial operations executive vice-president Charles Brand said: “Our customers need packaging solutions that can help them capture opportunities and maximize growth. According to Tetra Pak, global demand for portion packages under 250ml is estimated to grow to 72 billion liters by 2019 which is 10% increase from current volumes. Jasper Products president Ken Haubein said: “We are a co-packing solution provider for many brands. In December 2016, Tetra Pak has introduced new version of aseptic carton, Tetra Brik Aseptic 1000 Edge with Bio-based LightCap 30, marking a significant step in achieving fully renewable packaging goal. Manufactured using a bio-based plastic film and cap, made from polymers derived from sugar cane, the new package has secured the highest class of Vinçotte certification for its use of renewable materials. Image: A Tetra Prisma Aseptic 250ml with DreamCap 26. 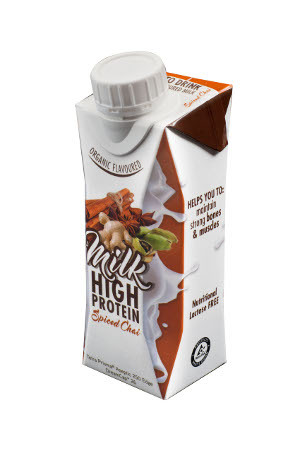 Photo: courtesy Tetra Pak International S.A.